Winners will continue to get scholarship every month, although not playing in the tournament anymore. Scholarship win in more than one time can be added. Scholarship winner must open Maybank Account or meanwhile can use parent’s Maybank Acc. If not, the scholarship will be accumulated until the Maybank Account is opened. The scholarship is a GIFT from Insofar. It is not a RIGHT. Yew Chor Hian claimed the title, undisputed champion. I'm only can get 5 point. This is just a training session before enter the Kedah Closed 2011 end of this month. I also get a chess book as a prize. Starting out:defensive play written by Angus Dunnington. Will try a few tips from this book to implement in next Kedah Closed. Kedah Closed, here I come......29 October 2011. See you there. Sebarang bantahan mestilah dihantar secara bertulis kepada Urus setia dan hendaklah diterima dalam masa 15 minit selepas tamatnya perlawanan yang berkenaan berserta wang cagaran RM 500. (Ringgit Malaysia : Lima Ratus Sahaja) Wang ini tidak akan dikembalikan sekiranya bantahan itu gagal. Jom sama -sama join tournament ni. ●.Yuran Pendaftaran boleh dibayar pada hari pertandingan sebelum pukul 8 am. I'm not in top 15. Try again next year. 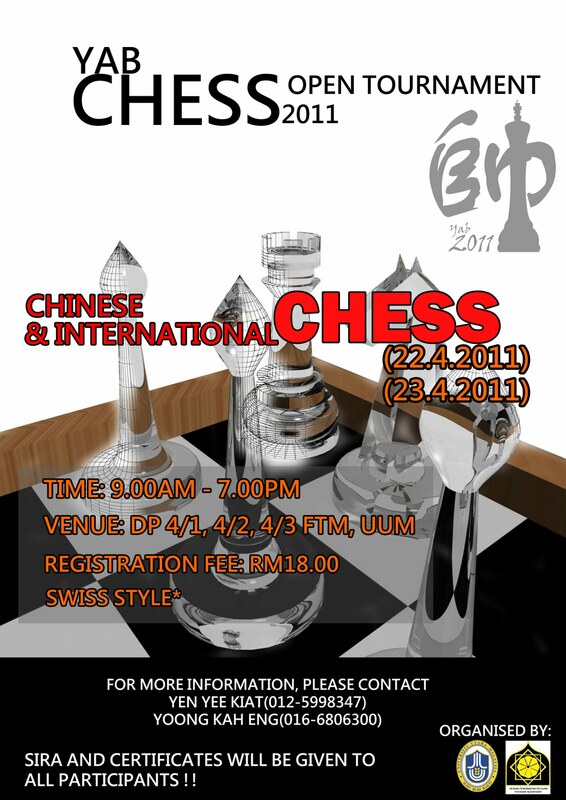 Untuk makluman semua, pihak penganjur terpaksa menukar venue Kejohanan Catur Terbuka Perlis 2011 (30 April) dan Gula Perlis Open ChessChallenge 2011 (1 Mei) dari Dewan Warisan ke Dewan Belia (di hadapan Hospital Tuanku Fauziah, Kangar). Memandangkan ruang di venue tersebut agak terhad, maka penyertaan bagi setiap kejohanan terpaksa dihadkan kepada 200 peserta pertama sahaja. Para peserta yang berminat untuk menyertai kedua-dua pertandingan ini, diseru untuk menyempurnakan pendaftaran dengan membuat pembayaran awal, untuk mengelakkan nama digugurkan dari menyertai pertandingan ini. A 2 day tournament at Mayang Sari Resort, Dungun, Terengganu. Two tournament in perlis in 2 days , 30 april 2011 and 1 May 2011 at the same venue. 3 main line about Budapest opening can view from this youtube video, enjoy and try use it in tournament. Good luck. Another sad day for me, once again cannot join this event because of not enough player to produce a team because of last minute withdraw. Still enjoyed watching other friends game. Next week, I absolutely will play at Sungai Petani, SMK Bandar for Kedah Open 2011. A national rated event. I think Kedah Open is good event, but there was a complaint from a few individual about the structure of the prizes. For me, the organizer have the right to do what ever they wants. En. Yahaya already contribute a lot of money to make this event success. Team Bayu Tiara still in the list, but no re-presenter. Below are the result after round 3. I missed this year tournament due to work commitment. Congrats to NM Evan Timothy Capel for his excellence without losing any game. 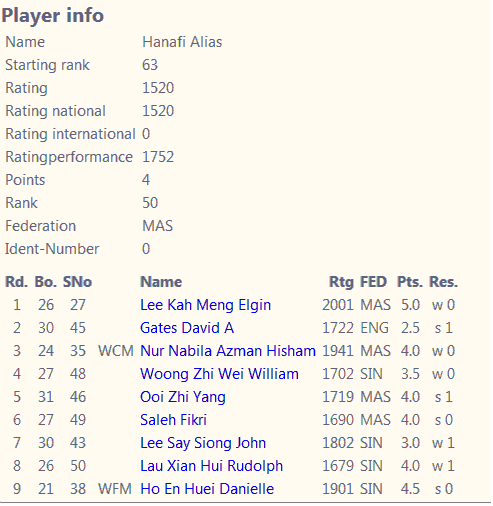 This year we can see the youngster conquer the main prizes except Chuah Heng Meng (1st runner up). Congrats to all winners. Full result can <click here >: taken from chess result.